Get the best email signature, branding and disclaiming experience plus a brilliant anti-spam solution in one great value bundle for Microsoft Small Business Server. We know all about Small Businesses because we’re a small business. We know email is mission critical. We know you need the same high quality software solutions as the big boys. We understand that you’re looking for low cost of ownership and a great deal. That’s why we’ve packaged up our best products into a great value bundle just for users of Microsoft Small Business Server 2011, 2008 & 2003. You want standardized but personal Outlook signatures deployed across your company with a single click? Check out Signature Manager. It works just great with any version of SBS. If you want more control with centralized email branding and disclaiming plus cool auto-responding and mail forwarding with SBS 2003 then take a look Mail Utilities. For SBS 2011 & 2008, we can offer you Mail Disclaimers, our premium email signature, branding and disclaiming solution. We love our spam filter. You turn it on and the Spam stops. That’s it. You don’t need to know anything about DNS servers or block lists. Just install it and the spam’s gone. Whatever version of SBS you have, our great value SBS bundles include a filter that kills spam dead. You can find out more on our Mail Utilities pages. What’s in the box for SBS 2003? If you’re using SBS 2003 then you get Signature Manager plus Mail Utilities at one great low price. You get all the email signature, branding and disclaiming capability you could ever need plus anti-spam. What’s in the box for SBS 2011 and 2008? For SBS 2011 and 2008, you still get Signature Manager but you also get Mail Disclaimers to give you a whole new level of email signature, branding and disclaiming power. There’s also a special edition of Mail Utilities to provide you the same level of anti-spam as the 2003 guys. What Now?We recommend you take a look at the information on the individual products below to find out more about all the great stuff on offer for SBS users. If you're interested in finding out more or would like a trial, contact MA Technology Solutions today. Add dynamic, personalized and professional email signatures, email disclaimers and email banners to make Microsoft Exchange 2010 & 2007 emails look as great as your traditional communications. Think of all those extra brand impressions on every corporate email. Use vCards in email to implant contact details, and a photo ID, as a virtual business card that readers can click to add all your numbers, addresses and your photo. And don’t forget the disclaimers your legal guys insist on to keep you compliant. Like you’d expect, a product called Mail Disclaimers handles those just great. Use the powerful editor to create your own email disclaimer and email signature templates or feel free to be inspired by our massive library – or use Template Editor to create, update and refresh them on your own PC without touching your mail server. Outlook Signatures are great for getting names, job titles, contact details and even cool branding elements into every corporate email that you send. They’re an easy way to let your customers know who you are and how to get hold of you - and just think how happy marketing will be with all those extra brand impressions. Trouble is… Microsoft never gave you a way to centrally manage Outlook signatures. So what do you do? You visit each user and update their Outlook signature by hand? Maybe you’re smarter than that and you get your users to try updating their own? Whatever you do, some people will ignore you and some people, like Joe from Accounting, will always mess up. Result? You and your company look bad. The answer is Outlook Signature Manager from Exclaimer. Create personalized and professional Outlook signatures to make external emails look as good as your traditional communications. Use the powerful editor to create your own dynamic Outlook signature templates or feel free to be inspired by Exclaimer's extensive library. And the best bit is…when you hit the save button, everybody gets their new Outlook signatures – even those tricky remote users that are always on the move and never get time to stop by the office. That’s it. No more running around, no more emails and no more mess ups. Your users can get on with sending great looking mails and you can get on with the important things in life. You’d expect a product called Exclaimer Auto Responder to be a great way to set up an incoming email auto response for Microsoft Exchange 2010 & 2007 and you’d be right - but there’s a lot more to it than that. Modify email senders and recipients, change subjects, block emails, discretely blind copy emails to manager’s mailboxes and auto forward emails. There’s some cool stuff in here. Starting at the top, we’ve really thought about the problem of email auto replies. Create personalized, dynamic and professional email auto response templates containing recipient and sender Active Directory data and even content from the original mail like the subject or body. Maybe you’d like to attach a brochure to your auto reply? Perhaps you want to brand and personalize it? You can do it all with Auto Responder. You can even use it to centralize and manage your out of office needs with time limited email auto response policies. Then there’s all the other stuff. Redirect messages to different recipients or just update the domain names when you’ve moved domains. Change email senders or recipients and prevent emails between certain senders and recipients to enforce an ethical rules policy. There’s a lot of power here, but no complexity. We’ve even come up with a friendly scenario wizard to hold your hand. Exclaimer Anti-spam for Microsoft Exchange 2007/2010 and Small Business Server 2008/2011 eliminates the everyday threats and hassles from spam so effectively that you’ll forget you have it installed. Did you know that Exchange 2007 and 2010 contain some neat Anti-spam filters? Did nobody tell you about the handy PowerShell commands like set-filtersenderconfig for configuring them? Maybe you were too busy doing your day job to check them out? They work great, but they’re hard to find and tricky to use. 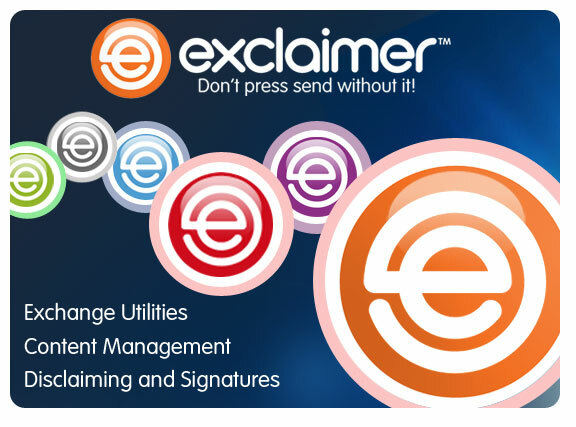 Exclaimer Anti-spam takes the best bits of Microsoft’s Exchange filters and gives you simple and intuitive ways to manage them in a single friendly interface. If you want to make sure your employees gets all their email, spam and all, Exchange needs you to configure an exception for each filter. Exclaimer Anti-spam manages coherent white and black lists intuitively in one place - just the way you’d expect.